Anne Waldman, born in Millville, New Jersey on April 2, 1945, became a part of the East Village poetry scene in the late 60's. She ran the St. Mark's Church Poetry Project, and gave exuberant, highly physical readings of her own work. She became a Buddhist, worshiping with the Tibetan Chogyam Trungpa Rinpoche, who would also become Allen Ginsberg's guru. She and Ginsberg worked together to create a poetry school, the Jack Kerouac School of Disembodied Poetics, at Trungpa's Naropa Institute in Boulder, Colorado. 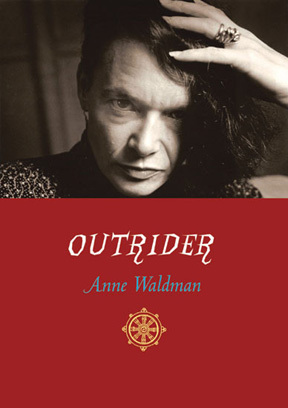 Anne Waldman is one of the most distinctive and confident poets among the latter-day Beat community. Her confluence of Buddhist concerns and thought-paths with sources of physicality and anger is particularly impressive. No Responses to "Anne Waldman"